MonaVie seeks revival of passions and sales after spectacular but checkered past. Leah Hogsten | Tribune file photo Dallin Larsen, center, is the founder, chairman and CEO of MonaVie, a nutritional drink company that says it has sold $2 billion worth of its products since its founding in 2005. Leah Hogsten | Tribune file photo Dallin Larsen, right, with wife. Karree Larsen. is the founder, chairman and CEO of MonaVie, a nutritional drink company that says it has sold $2 billion worth of its products since its founding in 2005. The once-surging Utah-based seller of a blend of fruit juices, MonaVie LLC, is rebranding itself to the world as "MonaVie Community Commerce: The No. 1 Business Opportunity." The new slogan is the South Jordan company's effort to stir up some of the passions and sales that sprung up after its debut almost eight years ago, when it built a cult-like following and generated billions of dollars with a concoction of juices formulated around the supposed healthy attributes of the açai fruit from the Amazon jungle. The company hopes the phrase better represents what multilevel marketing  also called direct sales or network sales  in which company revenue comes from selling products to independent distributors. Distributors, in turn, are told they can earn anywhere from a few hundred dollars a month to fabulous riches through retail sales and commissions from building "downlines" of distributors beneath them. But behind the new slogan, which suggests a kind of intimate, we're-all-in-this-together, friends-and-family business model, still lies a stark statistical reality. 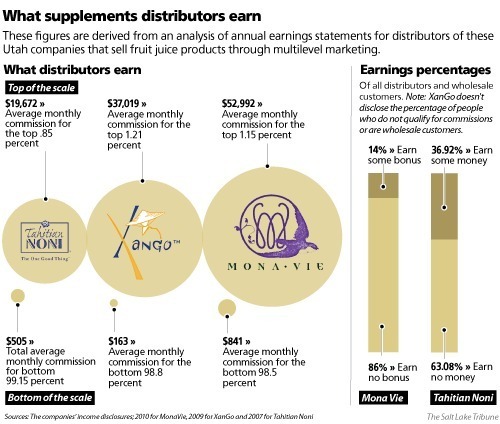 An analysis of the average earnings data provided by MonaVie in 2009, when it last supplied distributors with comprehensive numbers, reveals that 98.5 percent of distributors who earned commissions averaged just $129 a month despite the pitches to the contrary. The history of the rise of MonaVie also reveals a spotted record of exaggerated claims of relief from serious illnesses and questionable claims of nutritional values, as well as odds clearly stacked against low-level distributors who poured in the billions of dollars that fueled the company's spectacular growth. MonaVie's story also raises questions about the foundations on which other companies in that thriving segment of Utah's multibillion-dollar nutritional supplement industry were built. MonaVie representatives declined to answer specific questions or verify facts for this story, saying the company was disappointed that TheSalt Lake Tribune "continues its assault on the direct sales industry in Utah." Behind the rise of MonaVie is Idaho native Dallin Larsen, the co-founder, chairman and CEO who got his start in multilevel marketing as a distributor for Nu Skin Enterprises, the multilevel marketer of skin-care and nutritional products, then was president of a string of weight-loss clinics before he became vice president of sales for Usana Health Sciences, also a seller of nutritional and personal-care products. 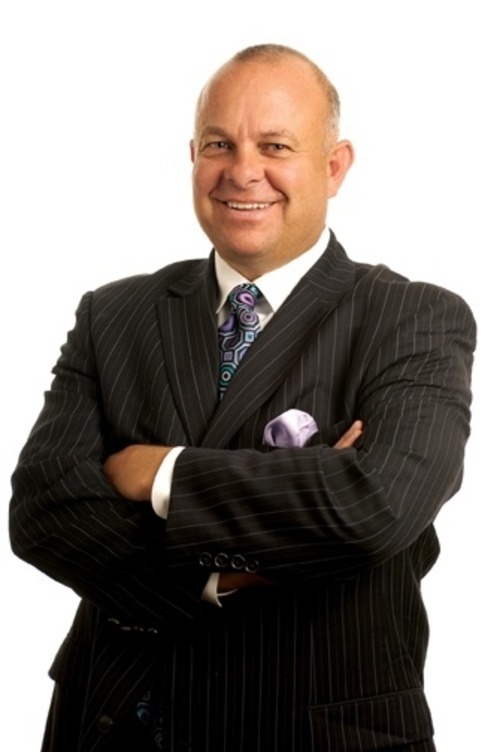 In 2001, Larsen became vice president of sales for Dynamic Essentials in Lake Mary, Fla., which sold a fruit juice called Royal Tongan Limu, where he claimed to have increased revenue 300 percent. But in 2002, during Larsen's tenure, the federal Food and Drug Administration issued a letter to Dynamic Essentials warning that claims on the company's website that the juice could "treat various diseases such as cancer, arthritis, and attention deficit disorder" were in violation of federal law. Dynamic Essentials sometime after that ceased operation. In October 2003, the FDA said it witnessed the voluntary destruction of 90,000 bottles of Royal Tongan Limu. Larsen left Dynamic Essentials in February 2003. The Brigham Young University grad returned to Utah for his next venture. Monarch Health Sciences was registered in the state in August 2003 with a focus on weight-loss products, listing Larsen as co-founder, along with Henry Marsh, the former Olympic track and field athlete, and others. Early on Monarch, which in 2005 became MonaVie, began using millions of dollars of incentives to lure away successful distributors from other MLMs in order to rapidly build its own business. One of those was Brig Hart, a Bible verse-spouting reborn Christian from Florida, who came to Monarch after holding a highly successful top-level position at Amway, the original multilevel marketer, before he had a falling out with the company. Another was former top Amway distributor Orrin Woodward, who received a $3 million loan from Monavie he didn't have to repay if he met certain recruiting distributor goals, according to a lawsuit Amway filed against MonaVie in 2008 that was settled last year. A lawsuit by nutritional juice company Tahitian Noni said one of its distributors also was offered more than $3 million to join MonaVie. "There are companies who believe their distributors are the property of that company," Larsen said in a 2010 interview. "I believe in free enterprise, and if distributors decide that his or her dreams and goals are better served in this company than that company, they ought to have a right [to change]." That may have been the dream, but the payments to lure in top-level distributors also illustrate the company's practice of providing capital to help certain distributors, while telling new ones they can prosper with little investment. Hart said in an interview earlier this year that when he approached Monarch he found a company "merchandising substandard weight-loss products" but in time was able to convince its officers to emphasize the açai juice. Soon after MonaVie was launched in early 2005 with its signature juice, Hart and others started making claims that there was evidence it could relieve various conditions and diseases, including cancer. At one meeting, top-level distributor Jason Lyons said that MonaVie was "helping people with arthritis, diabetes, cholesterol, high blood pressure, aches and pains, energy levels, sleeping, just numerous ailments out there," according to transcripts that are part of the Amway lawsuit. "You have indicated, as I understood it, during your deposition today, that you never understood or knew the contents of MonaVie's drink. Is that correct?" "When you say completely, what do you mean by that?" Answer: "If you were to ask me how much açai is in the product, I do not know." Beyond the claims of relieving various ailments, there also are basic problems with nutritional claims. MonaVie Essentials, the company's original juice blend, is touted on its website as "delivering "the antioxidant capacity of approximately 13 servings of common fruits and vegetables in just four ounces." Antioxidants are good for your health but, according to nutritional experts in academia and nonprofit groups, there's no adequate research to show that the body can make use of that big a dose. In 2008, researchers at the University of California, Los Angeles, also found açai to be a middling source of antioxidants, ranking behind red wine, pomegranates and store-bought grapes, and blueberry and black-cherry juices. A 2007 publication by the Australian Consumers Association found that a common apple beat the antioxidant potency of juices containing açai, mangosteen (used by XanGo), noni (used by Tahitian Noni) and the goji berry. Health advocates also recently criticized the promotion of juices as healthy, pointing to the concentrates of sugars they contained. Still, MonaVie rocketed to success. From 2005 to 2010, CEO Larsen said MonaVie generated more than $2 billion in revenue. "We went out and shattered records in direct selling, a 100-year-old industry," Larsen said in the 2010 interview, adding, "We've just been blessed." With numbers reported by the company, Inc. magazine in 2009 named MonaVie the 18th-fastest-growing private U.S. company, with a growth rate of 5,883 percent from 2005 to 2008. Larsen was named the Ernest & Young entrepreneur of the year in 2009 in the emerging-companies category. The company declined to provide its profit margin, but Vice Chairman Henry Marsh has said it was similar to publicly reporting companies such as Nu Skin. For 2010, Nu Skin reported a gross margin  profit divided by revenue, the higher the margin the more profitable the company  at 82 percent. So who benefits from those high profits? MonaVie and other MLMs fervently preach about the business opportunities they present for a potential distributor. But, according to MonaVie's distributor income disclosure statements, the vast majority  at least 86 percent of all those who sign agreements  don't earn any bonuses. MonaVie says the 86 percent includes those who signed up only to buy the product at wholesale prices, but it won't provide a breakdown of how many of those simply failed to recruit any other distributors and earned no money as a result. Counting only distributors who earned commission checks in its 2010 statement, the very top 1 percent of MonaVie distributors took home an average of $52,992 per month, compared with the 99 percent who averaged $841 a month. Only .05 percent  34 people out of 92,000 or so active distributors  earned a million dollars or more in 2009. For earnings that could be considered a car payment, only 5 percent of commission-earning distributors received an average of about $300 monthly. And about 90 percent made even less than that. To put it another way, those 95 percent all together averaged only $200 a month. At XanGo in 2009, the latest available income statement, the top 1.2 percent of distributors received an average of $37,019 a month, while the rest  98.8 percent  averaged $163 in monthly commissions, according to the company's own analysis. "As would be expected in any sales organization and even retail, those who spend the most time building their business and who treat it as a full-time job ultimately make the most income," spokesman Jeff Chandler said in a statement. For Tahitian Noni in 2007, 83.6 percent of distributors who earned commissions received only an average of $55 a month. Andre Peterson, a spokesman for Tahitian Noni, said having the number of distributors in each level of earnings would provide a more accurate picture of average earnings but then he declined to provide those numbers, saying it was proprietary information. Yet those totals still don't figure in the expenses that each distributor has, figures the companies did not provide. But the experience of Donna Pierce of Corona, Calif., provides a glimpse. She looked to be a typical MonaVie distributor in 2009. In her accounting of 11 months of her MonaVie distributorship, she earned an average of $209 a month in commissions, putting her somewhere among those in the lowest categories, where 98 percent of all commission earners reside. But her expenses averaged $520 a month, an average loss of nearly $311 a month. For the 11 months she accounted for in a filing in bankruptcy court in California, June 2009 to April 2010, she lost $3,418, with deficits every month. The other factor that argues against making a success as a distributor is the turnover rate. MonaVie and other MLMs in Utah do not disclose such rates, but the Direct Selling Association estimates the average annual rate of people leaving MLMs is 56 percent. That means statistically a company loses all of its distributors in a little less than two years. Because their revenue comes from sales to distributors, the companies must constantly recruit new sources of sales. Top-level MonaVie distributor Hart freely admitted in an interview earlier this year that the MLM business was about constantly attracting new people. "I have nothing to lose or gain in telling the truth. I love this industry," Hart said. "But our industry is all about sponsoring them faster than they quit. So you have to put them in faster than they get out." By 2009, MonaVie showed a massive decline in revenue because of the recession and, perhaps, what one industry insider referred to as "juice fatigue," referring to the number of companies slugging it out in that arena. Hart said MonaVie revenue was off about half from its peak, although by the time of the March interview he said it had stabilized. As the new year approaches, MonaVie is aiming to make a comeback. 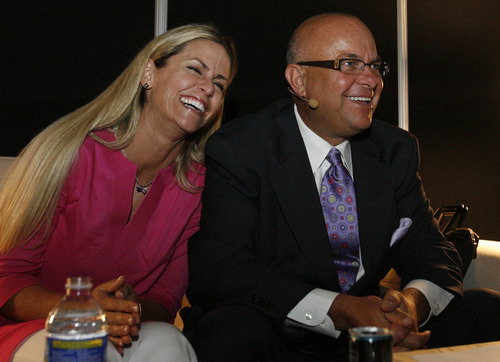 On Jan. 13 in Dallas, the company is launching MonaVie 2.0. It has hired as its new chief marketing officer Jeff Cohen, a veteran of companies such as CBS, NBC, Turner Broadcasting, Kellogg's and Coca-Cola. He said MonaVie 2.0 will relaunch the company with a line of products and MonaVie Ink Inc., the new marketing and communications company that Cohen directs. MonaVie Ink Inc., a full-service marketing and communications company owned by MonaVie, will provide services to distributors, some of which they will have to pay for, a spokesman said. "It will be a game-changer," Cohen said, declining to elaborate on the new product line. He said he coined the Community Commerce phrase to better explain multilevel marketing. MonaVie Ink will use the slogan to promote "the business we're in, the direct selling business [that] is the solution for the world's problems and jobs," Cohen said. "MonaVie is taking a real big step forward in doing that. So we are taking the message out to the masses." Which is a better gamble? Privately held juice companies say their profit margins are similar to publicly traded companies. Nu Skin Enterprises, a publicly traded Utah-based multilevel marketer of body care products, reported to the Securities and Exchange Commission that in 2010 it paid back 42 percent of its revenue to distributors. That means that for each dollar a distributor put in  multilevel marketer revenue comes from distributors  he or she typically got back only 42 cents, although of course a few distributors get back more, and some just buy the product with no expectation of a return. "It is unfortunate that the Salt Lake Tribune continues its assault on the direct sales industry in Utah  an industry that has done so much to improve lives, not only here in our home state, but throughout the world. We are particularly disappointed that the Tribune has chosen to revisit and recycle old and worn allegations related to our company at this time. As a 7-year-old company, we are proud to be a major employer in the state of Utah and to produce quality products and offer an entrepreneurial opportunity that is changing the lives of millions of people around the world. "We are also gratified to have the opportunity to continue to expand the work of our nonprofit charitable initiative  known as The MORE Project  [which] is providing hope, critical resources and educational opportunities to thousands of impoverished children and families living in the slums of Brazil. "As we approach 2012, our company is on the threshold of a bold new chapter that we are calling MonaVie 2.0, that will enable us to expand our mission to provide a more meaningful life to people everywhere. As our founder, Dallin Larsen, has stated on many occasions, our goal is not necessarily to be the best company in the world, but the best company for the world, and we believe we are on track to achieve that vision." Coming Monday • Consumer habits are unlikely to change despite studies concluding some supplements cause harm.